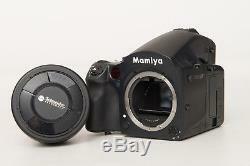 Mamiya (Phase One) Leaf Credo 40 digital back in very good condition. 40MP Digital back Lens is clean, no mold, no sand, no scratches. Shutter count: 8988 43.9 x 32.9mm DALSA CCD Sensor 3.2 1.15MP Touch screen LCD 1.2 frames/sec Mamiya Sekor D 80mm 2.8 leaf shutter lens designed by Schneider. Leaf shutter lens enables higher sync shutter speed. Original factory protective film still on LCD screen on digital back. Three (3) lithium ion battery for digital back. Hanhel Twin V Pro dual charger. Factory service in December of 2016 for general maintenance and cleaning. Glass is clean, no scratches, no mold, no sand. Has only been used for one shoot since the factory service. 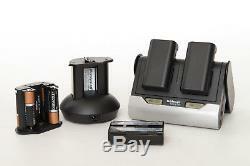 Mamiya 645DF LI_ION battery & charger. 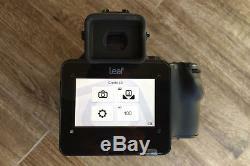 The Leaf Credo 40MP Digital Back Kit with 645DF+ Medium Format DSLR and 80mm f/2.8 LS D Lens from Mamiya Leaf combines the 40MP Leaf Credo digital back with the 645DF+ camera and 80mm f/2.8 lens to create a fast, high resolution medium format photography system. The Credo 40MP Digital Back houses a 43.9 x 32.9mm DALSA CCD sensor for exceptionally detailed, color-accurate, low-noise images and is the fastest of the Credo digital backs with a full resolution capture rate of 1.2fps. Its 3.2 touchscreen LCD provides accurate verification of colors, shadow details and focus and the bright 1.15MP screen with 170º viewing angle allows for improved viewing in challenging light. Its intuitive graphical user interface (GUI) means more efficient browsing and smart navigation and the touch screen controls extend beyond the LCD to keep the viewing area clean of fingerprints and smudges. A dual core microprocessor and the latest CF technology provides fast capture and viewing rates and USB 3.0 and FireWire 800 technology offers rapid transfer speeds. An internal battery charger keeps you ready to work un-tethered and the brilliant LCD with Live View allows for clear focus and composition on the go. The Credo back provides Capture One workflow software to seamlessly edit, enhance and present images and, with Capture Pilot, you can immediately preview images with an Apple iPhone or iPad and remotely control your camera. Weather-sealed construction offers peace of mind when shooting in less than optimal conditions. The 645DF+ is an open platform, digital-only medium format camera that handles like a 35mm SLR, but with an image area almost 3 times as large (56 x 41.5 mm). It provides aperture-priority AE, shutter-priority AE, programmed AE (PH, PL setting possible), and manual TTL metering, center-weighted average (AV), spot (S), and variable ratio (A-S auto) exposure modes, auto-bracketing, and it uses the TTL phase difference detection method for autofocus. When used with one of three Mamiya D lenses, including the Sekor AF 80mm f/2.8 LS D, it allows you to choose between the integral focal plane shutter and the leaf shutter and can achieve flash sync speeds up to 1/1600s. The Sekor 80mm f/2.8 LS D Lens is a leaf shutter, normal digital lens with a 35mm equivalent focal length of 50mm. It is manufactured by Mamiya specifically for the 645DF+ camera and with top flash sync speeds of up to 1/1600 second and a maximum aperture of f/2.8 it is effective for bright professional strobe shooting and when shooting in available light. Please see my other auctions. 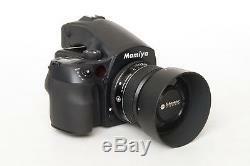 Mamiya 645DF+ (Phase One) Leaf Credo 40MP digital back kit. 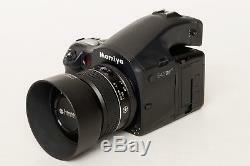 Mamiya 105-210 4.5 AF Zoom lens. 2 15mm 2.8 lens for Nikon. Nikon D800 cameras (2) Profoto ring flash and soft light reflector. Profoto D1 Air 1000W/s monolights (4 available). Profoto Acute 2 2400 generator (2). Profoto Acute D4 head strobe for Acute and D4. Profoto giant parabolic umbrella style reflector. Profoto 2x3' RF softbox (2). 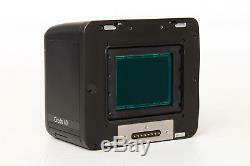 Profoto 3x4' RF softbox (2). Profoto 4'x6 RF softbox. Tenba AT-45V air case (3). Manfrotto 3333 basic light stand 9' (3 available). Calumet 6070 heavy duty extendable stand with telescoping boom. Manfroto 3398B convertible boom stand. Manfrotto 3051 tripod with geared column. Matthews Century C+ stands (2). Photoflex 39 x 72 diffused lite panel. Calumet 42 x 78 light control panel. Impact reflector frame with two 35" x 70" panels. Profoto 38 medium white umbrella. Lastolite 30 collapsible translucent reflector. Lastolite 30 collapsible silver and gold reflector. Calumet padded light stand and tripod cases. Westcott illuminator arm (for reflectors). 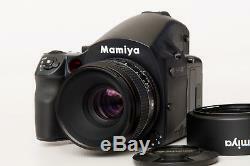 The item "Mamiya 645DF+ Leaf Credo 40mp medium format digital back kit" is in sale since Thursday, March 01, 2018. 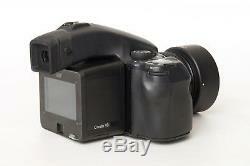 This item is in the category "Cameras & Photo\Film Photography\Digital Camera Backs". 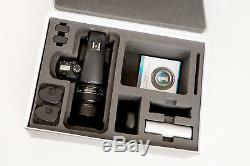 The seller is "andrewgrantphoto" and is located in Oceanside, California. This item can be shipped to United States.